Photograph: Reuters. Kindly note the image has only been posted for representational purposes. The first decision the Congress party took on forming governments in Madhya Pradesh and Chhattisgarh was to waive farmers's loans up to Rs 200,000, thereby fulfilling an election promise to do so within 10 days of coming to power. The move may have helped the Congress score brownie points over the Bharatiya Janata Party, but according to economists it would have a serious impact on the states's finances. It was not the Congress alone which has done this; the BJP too promised farm loan waivers in Uttar Pradesh before the 2017 assembly election and announced it on coming to power in Lucknow. Dr Rakesh Bhardwaj, principal scientist, Indian Council of Agricultural Research-National Bureau of Plant Genetic Resources, New Delhi, is hugely critical of loan waivers to farmers as he believes they only benefit a small minority of farmers. "This kind of announcement generates emotions in the country. Farmers feel this government is going to be our government. The BJP did it in UP and the Congress is doing it now, but hardly 10 percent of the farmers benefit," Dr Bhardwaj tells Rediff.com's Syed Firdaus Ashraf. How do you see this move by the newly elected Congress governments in Madhya Pradesh and Chhattisgarh to waive off farm loans up to Rs 2 lakh? I see it as a failure of policy. If we are allowing this to happen to farmers, then many more people will come forward and demand that their loans too must be waived. Ultimately someone else is paying for it. It is a systemic failure at the level of farming support system and maybe banks who have to link to the farming support system as when farmers are cultivating crops, it is also properly supervised so that farmers do not end up making losses because of mismanagement. In many cases, it is mismanagement (of farming). Socialism doest not work always. If we go the socialist way, then it will be a total failure as no one will work. The farmers's lobby argues that if corporate loans can be waived off, why not those of farmers? Corporate loans too must not be waived off. I have seen cases where a farmer has taken a loan and then used it for his child's marriage. Now how can he earn money on that loan when there is no income? Farm loan is easy and cheap, so it is taken. They build houses with that loan or set up small shops. The bank is giving loans, but there is no one checking whether the farmer is using the money for that (farming) process. I am not saying that this (misuse of loans) is so in 100 percent of cases. There should be a system where the failure is (avoided). When you are talking of farmers's suicides it is in case when crops fail. Why crops fail nobody investigates, but that investigation is needed. Scanty rainfall, bad harvests, sometimes over-production lead to losses. There is a need for policy. In our country today, so much sugarcane has been produced, which is not needed. Because we are an open democratic system we (farmers) do not want to listen to the government too. We should decide in which area which crop should be planted. If we do that, then we will have balanced production. Now if the government does this, the people will shout that the government has become draconian. Every year, farmers demand minimum support price for their crops and they ask the government to procure their crops. If that is the case, then the government must also have the right as to which crop has to be planted. When the government has no right to say which crops should be planted and which crops should be grown, then you come and demand that the government has to give you MSP. We have to have a strict policy as to which crop will grow in which area and what are the resources available. Also, what kind of soil supports the crop as in some states the water level has gone too low. Here the government must force it and stop rice cultivation. Even if the water level is too low, still the farmers want to go for paddy only because it is a comfortable crop like sugarcane. Instead, why are we not working on pulses and vegetables? Pulses are grown on the marginal land and not on mainland, why? Today, we have rice, wheat and sugarcane more than what is required, but there is a shortage of oil seeds and pulses, which we are importing. If the farmers know there are no takers for rice, wheat and sugarcane, there must be some reason why they are still growing these crops. One reason is the minimum support price as the government is procuring it, procurement is good. Secondly, these are comfortable crops and they don't have to invest in labour. Nowadays people are looking for comfort. Do you mean to say that the policy whereby the government gives MSP on 22 crops to farmers is wrong and flawed as it puts the farmers in a debt trap? It is a typical situation. Initially, the minimum support price started with wheat and then more crops were included. There is a problem also as the WTO (World Trade Organisation) says you have given farmers subsidy but under the WTO agreement you cannot give government subsidy. Whatever the situation, government procurement is a major reason for wheat, sugarcane, cotton and rice (cultivation). Farmers grow sugarcane because it can withstand hailstorms and also does not get destroyed by wild boars. So, why should they not grow sugarcane? We are growing sugarcane more than what is required. We don't need it. We should put emphasis on pulses and oil seeds which India still has to import. Why is nobody telling farmers what you are saying? I cannot say why, but politics always plays a part, be it the BJP or Congress. When we say India is an agrarian country, then why was there no policy on what amount of acreage should go for which crop so that we have balanced production and not get over-supply of a particular crop in the market? There is an argument that the problem is not about over-supply, but of traders who make money on farm products. While the farmers, say, sell onions for Rs 2 a kg to the traders, they in turn sell the same onions for Rs 20 a kg to consumers in the city. Managing traders is not an easy task. A simple solution would be to provide the farmers direct access to cities. Only farmers can come and sell in cities. Abolish the traders. The Maharashtra government tried to do so, but failed and had to withdraw its order. I am not aware of why it failed. But at least in big cities and middle level cities, farmers can sell their goods and customers will get a better price and fresh farm produce. Can we say loan waiver is both bad economics and bad politics? Do you have any statistics as to how many farmers take loans? And that too from a government bank, and what percentage of farmers are going to benefit from this move? But this kind of announcement generates emotions in the country. Farmers feel this government is going to be our government. The BJP did it in UP and the Congress is doing it now, but hardly 10 percent of the farmers benefit from this. Only 10 percent of farmers who have not repaid loans from government banks are going to benefit from such announcements. 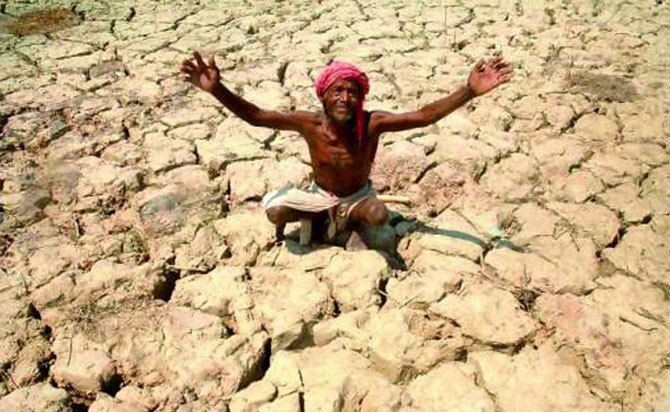 But the farmers who have worked hard and repaid their loan to banks, imagine their plight! They will be feeling like fools. This will also cause jealousy. Suppose a farmer took a loan from the bank for his daughter's marriage and didn't repay, and another took a loan, worked hard and repaid the loan, he will be thinking that he is a fool. Is it not possible to do farming without taking a bank loan? Many times the farmers feel the loan will be waived, therefore they take loans and don't repay. You are the first agricultural economist who is putting the blame on the farmers. I will say some farmers, not all farmers. So, is this some kind of scam? Some farmers know when elections are due. Before that, they take loans. They then ask their farmer unions for loan waivers and the political party who shouts first about a loan waiver (gets the votes). But is there a scam going on?